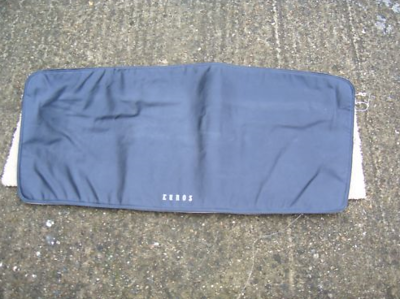 Thread: WTB EUNOS Rear window protection mat. I am looking for the Black Mat that covers the rear window when the soft top is down that says "EUNOS" not "CORNS"
You might reach out the guy that bought my car. I thought he didn't want to keep it in the car. Sorry, I don't have a better way to contact him. I put this one in my old car. I had no idea these were so plush underneath. No soft top is best, anyways. DM me. I was just offered one for sale from someone on FB this week. I'll get you the contact info. Can I share you number with the seller? He just messaged me! Thank you! Thanks to hammerhead I was able to workout a deal! The Eunos mat and also something else is on its way home. you will see the surprise soon. I'm glad it worked out! The seller reached out to me when he saw a pic of my 93LE turbo car and noticed a bunch of JDM stuff on it. I already have 2 of the domesticcally made rear window protectors, so I was in no need. As much as i love JDM bits, I'm a sucker for branding, so there's no Mazda or Eunos-branded stuff except for the headrest perfs on my Driver Option seats. I asked Revlimiter to recreate the MS logo in silver on red for my key fobs, nose and tail badges, oil cap, horn button, door sill covers and wheel caps. That is going to look awesome cant wait to see what Adam conjures up for you! Larry is the guy that bought my old car. That's his IG link above. He sent a bunch of pics of the car. Super nice!